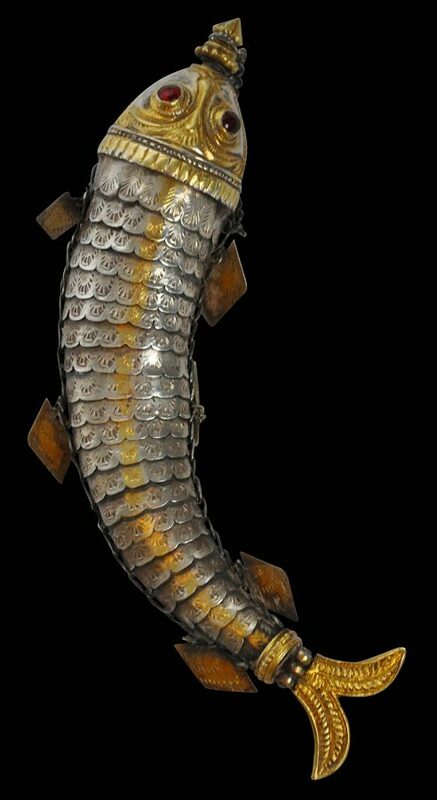 This fine model fish is of solid silver that has been partly gilded or gold-plated. It was made to serve as a container for kohl used as an eyeliner, or to hold red vermilion powder to be used for personal adornment and also to decorate images of household Hindu gods. It might also been used to hold perfume. 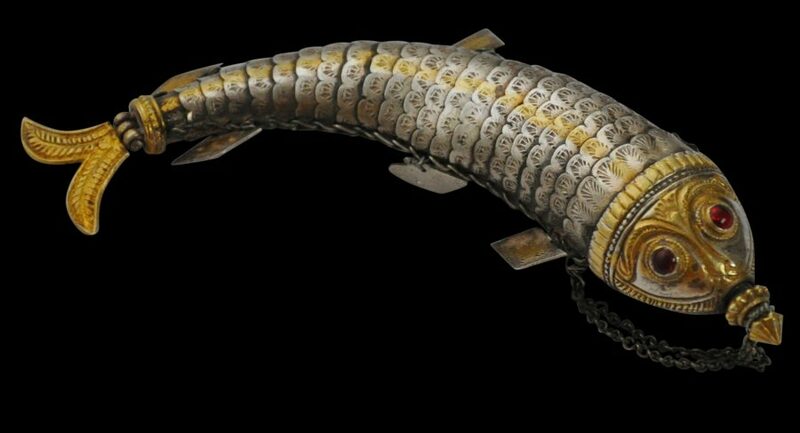 The body of the fish comprises dozens of engraved plates arrayed as rows of scales that have been ‘sewn’ together with silver wire. As such, the body of the fish has a muscular flexibility in the manner of a real fish. It is a finer-than-usual example of such a container with especially beautiful gilding work. The fish has also been constructed so that its body has a naturalistic curve – this is unusual as most such fish containers are straight. The mouth of the fish has a stopper which screws clockwise in the Indian fashion. The stopper is attached to the body of the fish by means of two silver chains. Two red paste cabochons serve as eyes. The fish has a prominent tail or caudal fin, two pairs of pectoral fins to either side, and a pair of pelvic fins below the body. Possibly, the form of the fish is modelled on amahseer, a fierce salmon-like fish known in South Indian rivers, with similar body shape and fins. One of the six fins might be a later replacement but otherwise, the fish is in excellent condition. Terlinden (1987, p. 95) illustrates several silver examples.